Make a glass bubbles coaster from transparent fusing glass and trapped air bubbles within a glass stringer grid. The glass and stringers are placed over a grid template and then glued in place. 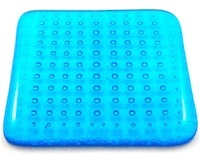 When fused, the glass bubbles coaster has rows of evenly spaced rows of air bubbles trapped between the stringer grid. The coaster is made from Bullseye three and a half inch square transparent colored fusing glass and stringers. System 96 may be used in place of Bullseye. The coaster size and transparent colors can be varied. Shelf primer or thinfire paper. Step 1. Cut two squares of transparent colored glass about three and a half inches square. Step 2.Place one square on a sheet of white paper and draw outline of square. With a ruler mark off quarter inch spaced lines horizontally and vertically. Draw lines to make up grid as per photo. Step 3.Cut stringers to fit on grid. Stringers should be from edge to edge. Step 4. Place glass square back on grid, line one layer of stringers up with grid lines and glue to glass. Once stringers are dry, glue next layer over the top to form the grid. Wait for glue to dry then place other square on top of grid. 3. 500°F (260°C) up to 1460°-1480°F (793°-804°C) hold 50 minutes. Once glass kiln has cooled to room temperature remove fused art glass coaster from kiln. Inspect coaster to see if it needs any cold working. Due to the overall thickness of the piece, any cold working should be minimal. The grid technique used for the coaster can be used to make inserts for plates, wall lamps or other fused glass art ornaments. Simply enlarge or reduce grid size to fit project size.